Sleek, personal vehicles that sail through cities on invisible highways are a staple of science fiction, from Star Wars to Blade Runner to The Fifth Element to Futurama to The Jetsons to....well, you get the idea. This is clearly something we expect and demand of our future. A startup in Germany is trying to build one. 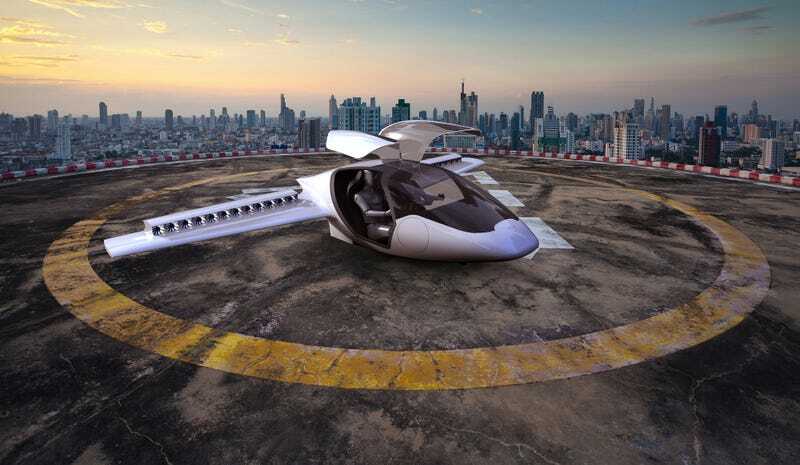 Founded in February 2015 at the European Space Agency’s business incubator, Lilium has spent the last year quietly working on a vehicle it’s billing as the world’s first vertical takeoff and landing aircraft for personal use. Unlike the flying cars of science fiction, which typically run on some combination of force magic and unobtanium, this one gets its juice from electric engines that have already been proven in small,~60 pound prototypes. Per the ESA, the Lilium vehicle “is intended for recreational flying during daylight, in good weather conditions and in uncongested airspace up to 3 km altitude”—so, like, the douchiest Costco trip ever. It’s meant to be pilotable by anyone after a 20 hour training session, and can take off from a launch pad as small as 50-50 feet, for instance, your backyard. If this sounds somewhere between fanciful and absurd to you, you’re not alone. It’s unclear how close the company is to actually producing one of these bad boys (they say 2018), what sorts of regulations it’d be subject to, or how much it’ll cost (if you have to ask, you probably can’t afford it). But Lilium did just drop some nice renders, which is really all that you need to get your idea noticed on the internet.